There is little empirical evidence to support the argument that subsidizing US exports is necessary to keep American companies competitive in the international market and thus promote American jobs. As the charts below show, growth in US exports is largely unaffected by the level of authorizations from the Export-Import Bank (Ex-Im Bank)—regardless of whether those authorizations increase or they decrease. From fiscal year (FY) 2007 through FY 2012, Ex-Im Bank authorizations increased from $12.6 billion to $35.8 billion. During this same period, US exports increased from $1.1 trillion to $1.5 trillion. However, the pattern from FY 2012 through FY 2017 was completely different: the Ex-Im Bank’s authorizations fell by nine-tenths of their FY 2012 value, down to $3.4 billion in FY2017. During this period, the value of US exports fluctuated slightly but remained relatively stable, near $1.5 trillion. In July of 2015 the Ex-Im Bank lost its quorum, meaning there were no longer enough members on its board of directors to approve individual aid packages of greater than $10 million. In fact, from July through November of 2015, the Ex-Im Bank did not approve any aid at all, as it lacked congressional authorization. 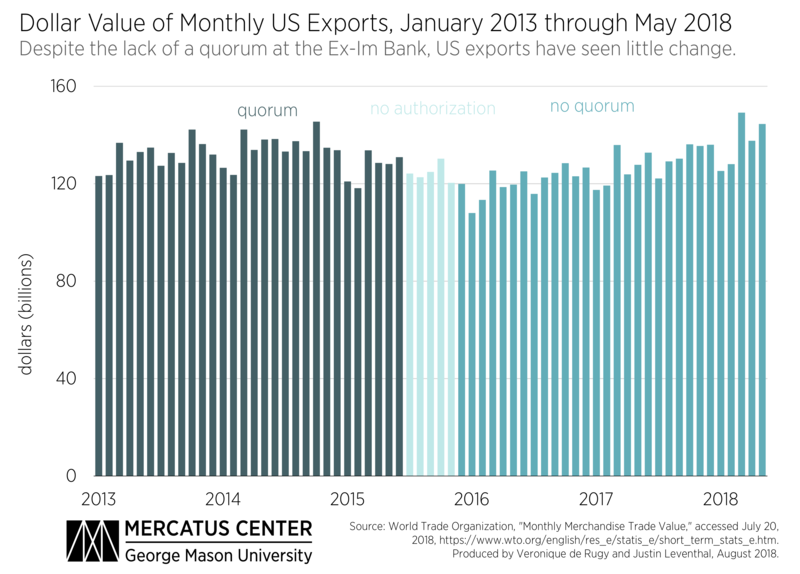 Despite this, the level of total exports at the end of 2015 looked substantially similar to the level at the beginning of 2013, a time when the Ex-Im Bank’s approvals level was close to its height. And aside from a small dip at the beginning of 2016, monthly US exports have not declined significantly since 2015. 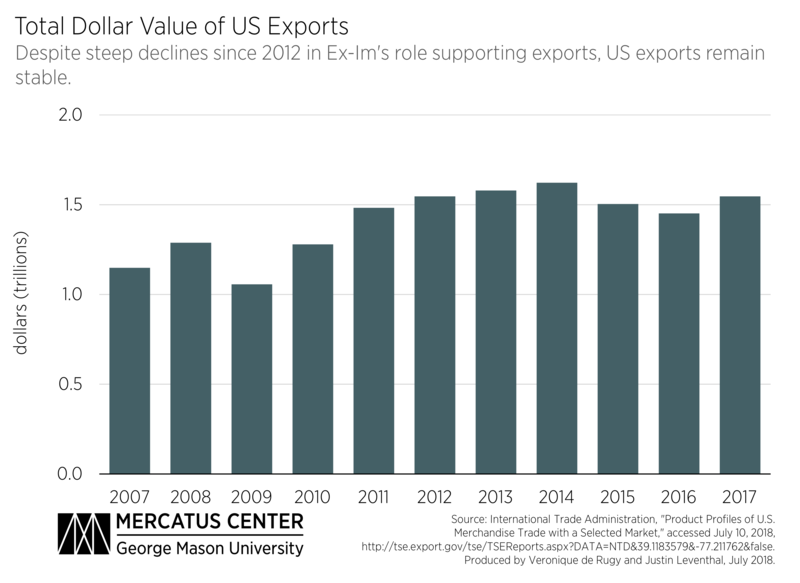 That total US exports are largely unaffected by the Ex-Im Bank’s actions should not come as a surprise. At the height of its authorizations in 2012, the $35.8 billion in support represented only 2.31 percent of US exports. 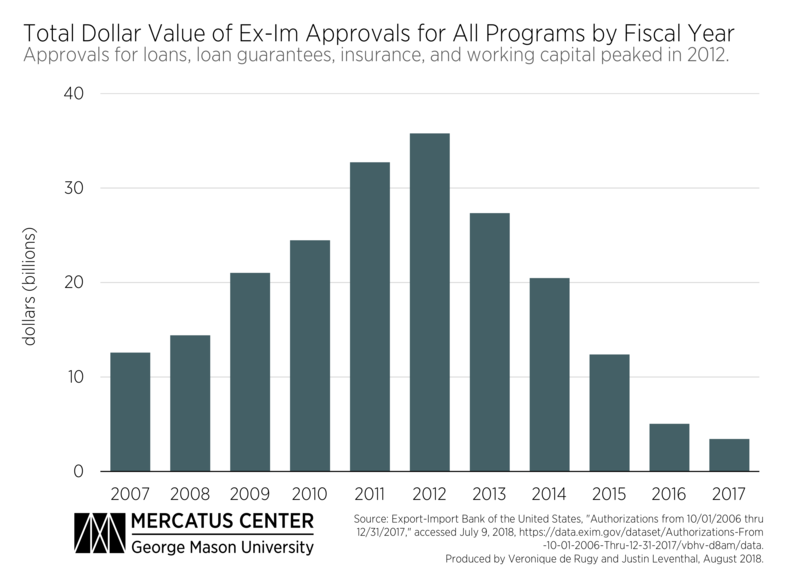 Given that over 97 percent of exports did not receive any subsidies at the height of the Ex-Im Bank’s activities, the decline in its approvals could not have affected, and did not affect, the vast majority of American exports.